The Balinese believe in the existence of supernatural spirits. They are not visible but can be felt, and can affect people's lives. Nothing supernatural spirits are good, some are evil. Same thing with the human, supernatural spirits also need a place to stay. The Balinese believe they live and inhabit large trees, boulders, caves, and places that are rarely visited lonely man. In order to not interfere with unseen spirits of human life, the Balinese always offering ceremony. Not to worship them, but as human beings respect to them, that they exist and coexist with humans. The offerings of the most simple but can have a big impact is by means of banten segehan. The offerings in banten segehan using basic ingredients rice. With a variety of flowers and fire. Banten segehan generally made ​​of colorful rice. Usually consists of four colors. When discharging banten segehan means, always laid down in the ground. Aimed at giving to the unseen spirits. 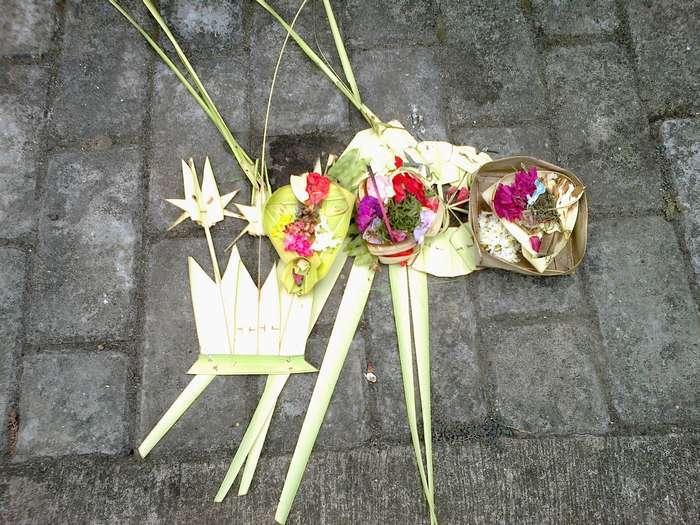 Laying banten segehan accompanied with canang sari, which means the Balinese ritual is made from the leaves and flowers. All were intended to allow human life to live peaceful, harmonious and happy, alongside all the magical spirits. Not against them.